2006 Monterey 250 Cruiser The Monterey 250 Cruiser packs more than you'd ever imagine into it's 27 foot overall length. The integrated swim platform includes a recessed telescoping boarding ladder, wet storage and ski rope compartment. The removable ice chest, plentiful drink holders and a standard top with side and aft canvas are all standard equipment on this stylish pocket cruiser. Below deck, the 250 invites you and your guests with many of the comforts reserved only for larger craft. Forward, the dinette offers spacious seating and converts into a luxurious double berth. A mid-cabin with double berth completes the sleeping accommodations for four. 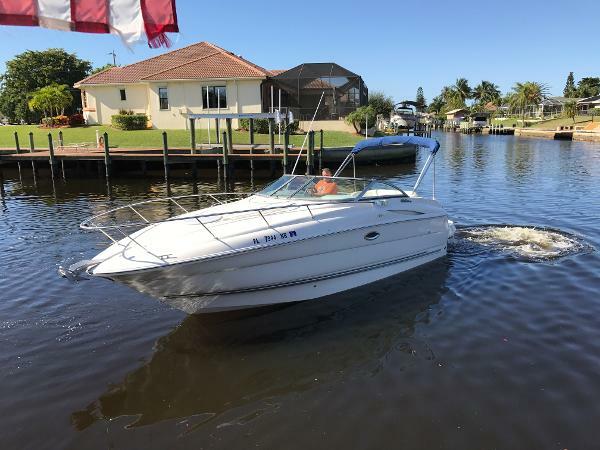 On the port side is a one-piece molded fiberglass galley built for easy cleaning. It's complete with an AC/DC refrigerator, alcohol stove, sink with faucet, 12-volt direct/indirect lighting and generous storage compartments. 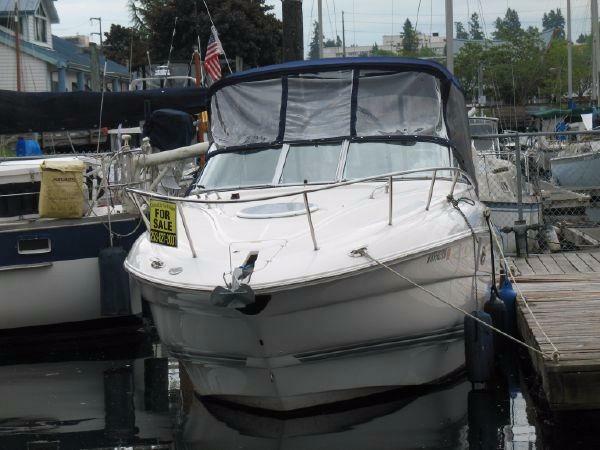 2004 Monterey 250 Cruiser Well Kept Pocket Cruiser with aft cabin plenty of room for overnight stays. 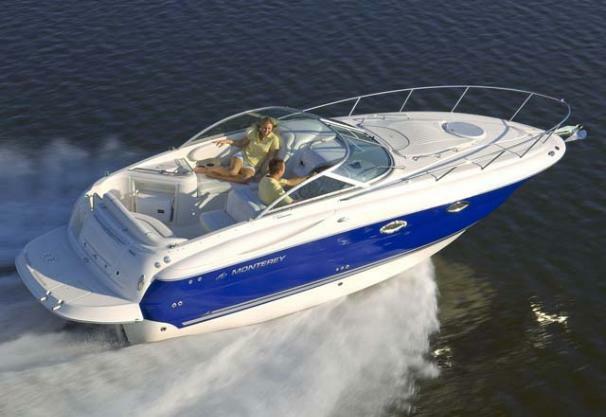 Power with MerCruiser 6.2L 320hp Bravo III outdrive. New batteries, manifolds and bellows this past seasons. 280 hours of use in brackish water. 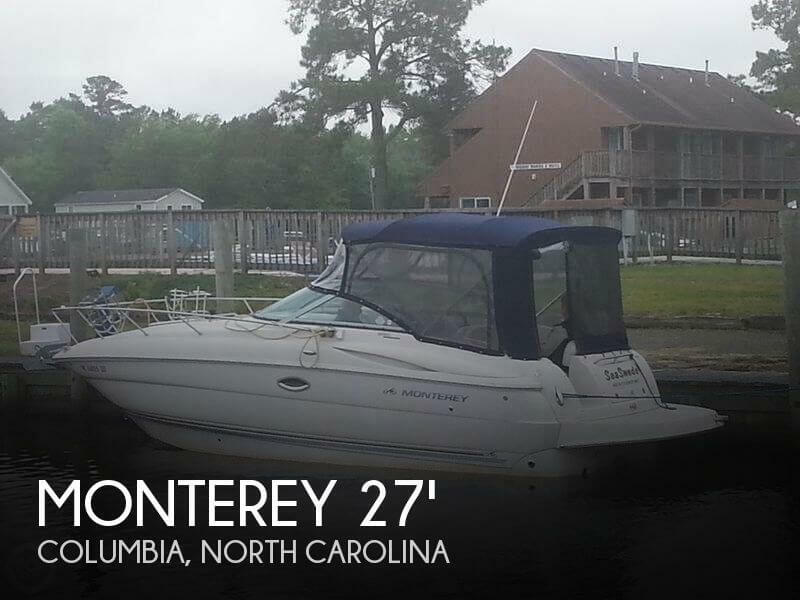 The Monterey 250 Cruiser packs more than you'd ever imagine into it's 27 foot overall length. The integrated swim platform includes a recessed telescoping boarding ladder, wet storage and ski rope compartment. The removable ice chest, plentiful drink holders and a standard top with side and aft canvas are all standard equipment on this stylish pocket cruiser. Below deck, the 250 invites you and your guests with many of the comforts reserved only for larger craft. Forward, the dinette offers spacious seating and converts into a luxurious double berth. A mid-cabin with double berth completes the sleeping accommodations for four. On the port side is a one-piece molded fiberglass galley built for easy cleaning. It's complete with an AC/DC refrigerator,stove, sink with faucet, 12-volt direct/indirect lighting and generous storage compartments. 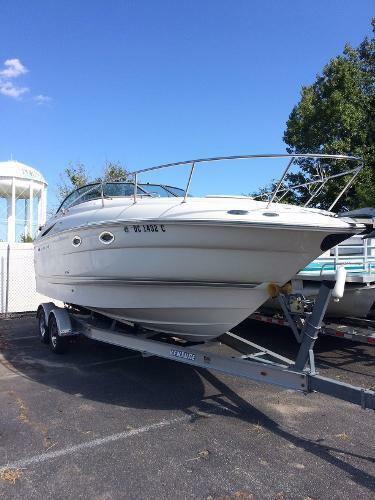 2004 Monterey 250 Cruiser Super clean low hour (208) boat loaded with options and priced to sell. Brand new manifolds and risers late 2016. Full Camper enclosure in excellent condition. All upholstery in great shape with no rips or tears. Volvo 5.7 GXI super clean. Boat was lift kept or barn stored its entire life and always flushed after each use. Never bottom painted. In addition to the cockpit cover she also includes a full cover. Pride of ownership is evident everywhere. Manufacturer Provided DescriptionThe 250 Cruiser packs more than you'd ever imagine into it's 27 foot overall length. The integrated swim platform includes a recessed telescoping boarding ladder, wet storage and ski rope compartment. The removable ice chest, plentiful drink holders and a standard top with side and aft canvas are all standard equipment on this stylish pocket cruiser. Below deck, the 250 invites you and your guests with many of the comforts reserved only for larger craft. Forward, the dinette offers spacious seating and converts into a luxurious double berth. A mid-cabin with double berth completes the sleeping accomodations for four. On the port side is a one-piece molded fiberglass galley built for easy cleaning. It's complete with an AC/DC refrigerator, alcohol stove, sink with faucet, 12-volt direct/indirect lighting and generous storage compartments. Helm Station: Dash with full instrumentation. Adjustable helm seat allows driver to sit or stand in total comfort. Stereo remote control. Removable Transom Seat: Rear transom bench seat can be removed for added cockpit space for fishing or entertaining. Portside Cockpit Wet Bar: The cockpit houses a convenient wet bar with drink holders, sink, cooler and storage. Molded-in portside chaise lounge. Foredeck Sun Pad: Sun pad comes with convenient safety grab rails and drink holders is easily accessed via walk-thru windshield. 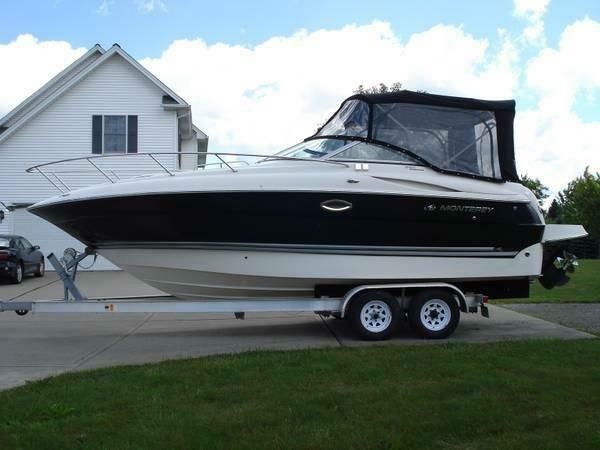 2005 Monterey 250 Cruiser The Monterey 250 Cruiser packs more than you'd ever imagine into it's 27 foot overall length. The integrated swim platform includes a recessed telescoping boarding ladder, wet storage and ski rope compartment. The removable ice chest, plentiful drink holders and a standard top with side and aft canvas are all standard equipment on this stylish pocket cruiser. Below deck, the 250 invites you and your guests with many of the comforts reserved only for larger craft. Forward, the dinette offers spacious seating and converts into a luxurious double berth. A mid-cabin with double berth completes the sleeping accommodations for four. On the port side is a one-piece molded fiberglass galley built for easy cleaning. It's complete with an AC/DC refrigerator, alcohol stove, sink with faucet, 12-volt direct/indirect lighting and generous storage compartments. 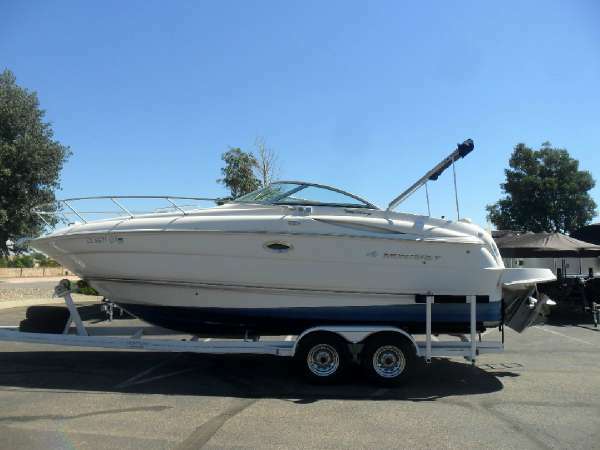 2007 Monterey 250 Cruiser The 250 Cruiser packs more than you'd ever imagine into it's 27 foot overall length. The integrated swim platform includes a recessed telescoping boarding ladder, wet storage and ski rope compartment. The removable ice chest, plentiful drink holders and a standard top with side and aft canvas are all standard equipment on this stylish pocket cruiser. Below deck, the 250 invites you and your guests with many of the comforts reserved only for larger craft. Forward, the dinette offers spacious seating and converts into a luxurious double berth. A mid-cabin with double berth completes the sleeping accomodations for four. On the port side is a one-piece molded fiberglass galley built for easy cleaning. It's complete with an AC/DC refrigerator, alcohol stove, sink with faucet, 12-volt direct/indirect lighting and generous storage compartments. Helm Station: Dash with full instrumentation. Adjustable helm seat allows driver to sit or stand in total comfort. Stereo remote control. Removable Transom Seat: Rear transom bench seat can be removed for added cockpit space for fishing or entertaining. Portside Cockpit Wet Bar: The cockpit houses a convenient wet bar with drink holders, sink, cooler and storage. Molded-in portside chaise lounge. Foredeck Sun Pad: Sun pad comes with convenient safety grab rails and drink holders is easily accessed via walk-thru windshield. 2005 MONTEREY BOATS 250 Cruiser Beautifully appointed interior and cockpit with wood grain accents. 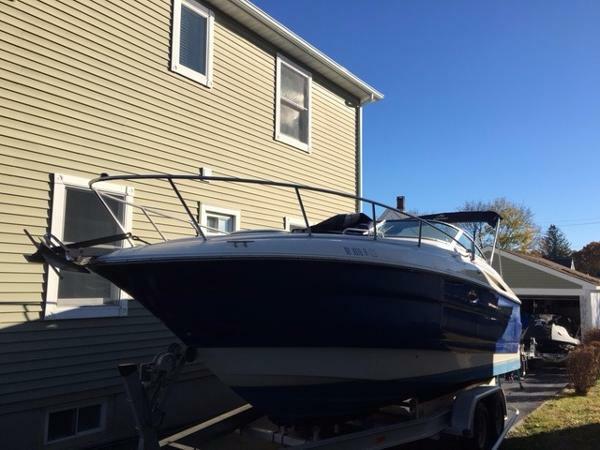 Excellent condition with new upgrades. 5.7 V-8 (280hp) Volvo - Penta with Only 185 hours. Call us for more information, full specs and to arrange a full viewing!! Price is negotiable, bring your best offer!